These pages are designed to accompany your reading of the novel 'THE HOURS BEFORE' by Robert Stehen Parry - also home to a selection of photographs and period artwork to add to your enjoyment of the story. The novel is set in the era of the Belle Epoque and brings together a number of unusual characters from areas as diverse as journalism, stage magic, big business and the occult. The setting spans the transition from Victorian to Edwardian times during the era known as the Fin de Siecle, meaning the turn of the 20th century. It takes the reader from London's Fleet Street to the remote Gothic settings of continental Europe. More details can be found on the author's website. And a special page of reading notes for bookclubs or reading groups can be found here. In darkness, late at night, a woman returns to her hotel to discover her usual maid has been replaced by a stranger. What begins as an icy exchange, born of weariness, becomes within minutes one of the most extraordinary encounters of her life. It will take her on a journey deep into her past and towards the fateful assignation that already awaits her on the other side of the night. 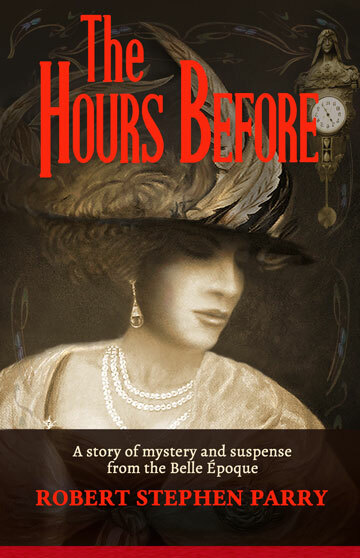 THE HOURS BEFORE is available in paperback and e-book, including kindle, nook and iPad. A video trailer accompanied by the music of Tchaikovsky and by details from various Belle Epoque paintings can be found on the author's website. Copyright Robert Stephen Parry 2018. All rights reserved.